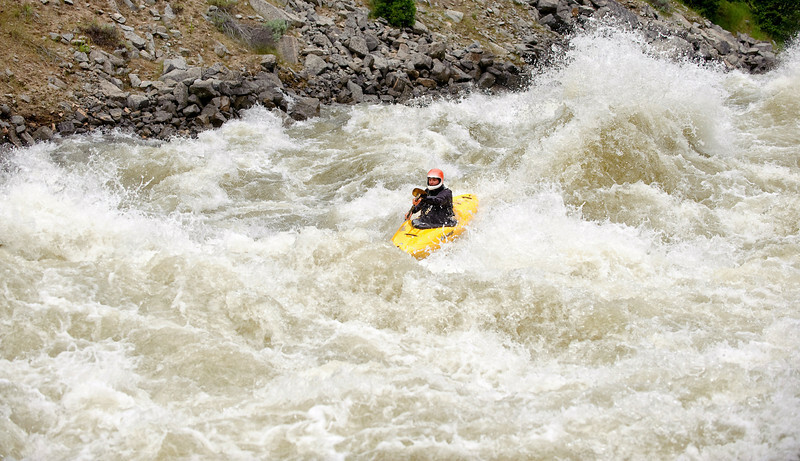 North Fork of the Payette River at 8000cfs. These are the highest flows in history on this river and these world class kayakers who ran the North Fork this week made whitewater history. The river may never be this high again. Ryan Casey yellow boat white helmet, Fred Coriel green boat dark helmet, Brian Ward yellow boat red helmet, James Byrd yellow boat orange top. I did not get everyones name. Action starting at Hounds Tooth and on through Juicer and Crunch at 8000cfs. The paddlers ran it from the top but I found them at Hounds Tooth.